Zakariyya Elogbani abandoned a degree in business management which he was taking at the university in 2014. Another student had been studying while on a terror protection order which was made less restrictive by a judge, a BBC investigation has found. University of Westminster says it takes its safeguarding duty "very seriously". This is not the first time that students at the university have been linked to violent jihadism - the notorious IS killer Mohammed Emwazi, known as Jihadi John, studied there until 2009. The BBC's investigation now exposes the secret funnelling of fighters and funds from the UK to IS in Syria. Elogbani, who grew up in east London, was captured by Kurdish forces in Syria nine months ago. Speaking to the BBC's Middle East Correspondent Quentin Sommerville, Elogbani said: "Obviously we came here intending to fight. That's the honest truth. But I don't think it was a love for blood." He said there was a group at University of Westminster who had already left for Syria before he even began his studies. "They kind of opened the way," he added. That may have been a reference to Mohammed Emwazi, who studied information systems at the university and left for Syria in 2013. He became infamous after appearing in videos in which he killed Western hostages. Emwazi died in a missile strike in November 2015. Elogbani denied knowing him but admitted seeing another of the British kidnap gang, known as The Beatles, in Syria. Another former University of Westminster student who went to Syria was Akram Sabah, a recruitment consultant who left the university in 2011 with a degree in biomedical sciences. He and his older brother Mohammed were killed in fighting in September 2013. The BBC investigation reveals that Elogbani travelled with fellow Westminster student Ishak Mostefaoui. His Algerian family had settled in London when Mostefaoui was five. He was a popular, football-loving boy, brought up in a home that was opposed to extremism but his father, Abderrahmane, told the BBC that his son changed in 2013. He believes his son was radicalised by people at University of Westminster. In April 2014 Mostefaoui told his father that he was going to Amsterdam for a few days, leaving with just a small bag. The family did not hear from him for a month when he called to say he was in Syria. His father says he collapsed when he heard the news. Around five months ago, Mostefaoui had his British citizenship revoked. Two months later he was badly injured when his house was bombed in an attack in which his wife and young son were killed. He is currently in detention. Elogbani says another three fellow students left around the same time as him and have since been killed. He claims one, Ibrahim, was killed in the siege of Raqqa, while Abu Talha "died in the desert of Anbar" and Abu Ubaydah was killed in Tikrit, Iraq. The BBC has not been able to establish all of their identities but one of them was Qasim Abukar, a hardened jihadist who previously fought with a militant group in Somalia. Abukar became a student at University of Westminster in September 2012. He played a key role in radicalising Elogbani, according to friends who have spoken to the BBC but do not wish to be identified. Abukar had been known to security services for years. He absconded from Britain to Somalia during a trial in 2009, in which he was accused of attempting to travel to Afghanistan for terrorism. He was acquitted in his absence. A separate High Court appeal heard that in Somalia, Abukar was "involved in fighting" alongside the militant group al-Shabaab and tried to recruit fighters in the UK for overseas operations. The court was told he was "potentially involved in attack planning" against Western interests. In 2011, after a period in custody in Somalia, he returned to the UK claiming he had been mistreated with the knowledge of the British state. He was placed on a control order and a Terrorism Prevention and Investigation Measure, or TPIM, to restrict his movements. TPIMs can be imposed on terror suspects, who officials decide can neither be charged nor deported, but who are nevertheless assessed to be potentially involved in terrorist-related activities. Despite being described in court as having played a "substantial role" in his extremist network, Abukar began studying at University of Westminster a year later. Because he had "a track record of absconding", he had to report daily to a local police station and wear an electronic tag. But in April 2013 he won an appeal to reduce one of the restrictions on his movements when a High Court judge permitted him to interact more with fellow students, despite warnings from MI5 that it would mean "the risk of him engaging in terrorism-related activity". This was in the period during which people close to Elogbani and Mostefaoui noticed their views were becoming extreme. They have told the BBC that Abukar was one of the people involved in radicalising them. Another key extremist at University of Westminster was Abukar's brother Makhzumi. He is serving a seven-year jail term after pleading guilty in 2016 to a million-pound fraud to steal the savings of pensioners. The scheme was uncovered by Scotland Yard's Counter Terrorism Command, who suspected the money was being funnelled to extremists in Syria. Court documents, seen by the BBC, reveal that when his home was searched in July 2014, only weeks after Elogbani and Mostefaoui had left the UK, notes found in his jacket recorded a series of financial transfers to a town on the Turkish/Syrian border known as ISIS International, because of its popularity as a handover point for foreign jihadists. 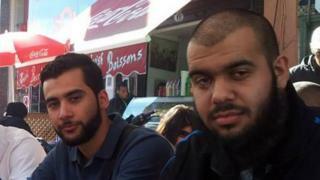 BBC News has learned of another student, Mohamed Jakir, who was killed in Syria. He was reportedly studying law at Westminster University but BBC News has not been able to confirm that. If true, it would take the overall number of fighters from the university to at least eight. Jakir was killed in 2014, seven weeks after crossing into Syria. A University of Westminster spokesperson told the BBC that the university "has a strong pastoral and interfaith focus providing care and support to its community of 20,000 students from more than 150 countries". In 2015 it commissioned an independent report after details emerged that Emwazi had been a student there. Fiyaz Mughal, one of the authors of that report, told the BBC: "The university failed to understand its duty of care around confronting and countering extremist views. "But more importantly it didn't even understand its duty of care and didn't understand the concept of things like Islamism and extremism." Mughal was concerned that the Islamic Society at the university, in which Elogbani was active, was "allowed to run its own fiefdom" where women and LGBT students were treated with hostility. The BBC has spoken to former members of the university's Islamic Society, who deny that there was a culture of extremism. Meanwhile Elogbani, stripped of his British citizenship, waits to find out his fate. 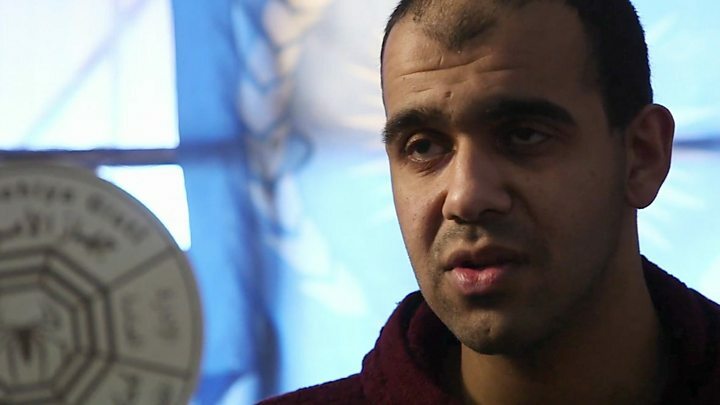 He cuts a forlorn figure in detention in Syria, having lost his legs in what he says was a missile attack in 2015. His is a cautionary tale of the price paid for supporting Islamic State. "I committed a crime by coming here," he said. "I guess I need to be punished." He had a warning for other people, who, like him, may be attracted to extremism. "Anyone that's still immersed by Islamic State methodology is wrong. "It's a gang. A lot of people are tricked. Don't fall into the same trick." In a statement, the Home Office said it did not comment on individual cases but pointed out that TPIMs provide some of the most restrictive measures available in the democratic world. Are you affected by the issues in the story? You can tell us about your experiences by emailing haveyoursay@bbc.co.uk.